When Anguel and I travelled to Greece, I was really excited to try all the food. Gyros were on the top of my list. However, what I (stupidly) didn’t think about was that most of the time...vegetarian + gyros is a non-starter. Duh. So when I saw a falafel-based version on the menu, I almost cried (happy tears). And while the falafel-based gyros were indeed delicious, texturally I craved something a bit firmer and meatier for my gyros experience. So, the wheels started turning on another way to put a plant-based twist on good ol’ gyros. And here we are. When it comes to mock-meat, I’ll be the first to admit it’s not my daily jam. Store-bought mock-meats are usually stuffed with so many unpronounceables, I get tongue tied even trying to read the package. Also, they usually taste weird. And with so many creative ways to cook plant-based meals, mock-meat is often unnecessary...although it is nice to have the option. Especially when it means you can indulge in delicious foods that are otherwise inaccessible to the meatless crowd! Seitan is a typical go-to when it comes to mock-meat. Sometimes referred to as "wheat meat", seitan is made from wheat gluten (the protein part of wheat). When kneaded and cooked, seitan becomes firm and surprisingly meat-like in texture. It’s pretty cool, I have to say. Especially when you consider how its origins are said to go back centuries to vegetarian Buddhist Monks in China. But stepping back, seitan is also basically a block of straight-up gluten, which can seem a bit like dinner overkill, you know?! So, after much testing, we’re pleased to share a delicious delicious seitan-ish recipe. The base itself relies primarily on beans (cannellini, to be specific). Spices and seasonings, like smoked paprika, oregano and thyme, provide a punch of flavor. Then, a smidge of wheat gluten comes in to provide just the right amount of meaty texture. It’s a match made in heaven. From a nutrition standpoint, cannellini beans end up being a great pairing for the wheat gluten. While wheat gluten is extremely high in protein, it’s an incomplete protein, due to its general lack of Lysine (an essential amino acid). But you know what does have lysine?! Cannellini beans. Put them together and you get a complete protein. Yup, we got you. 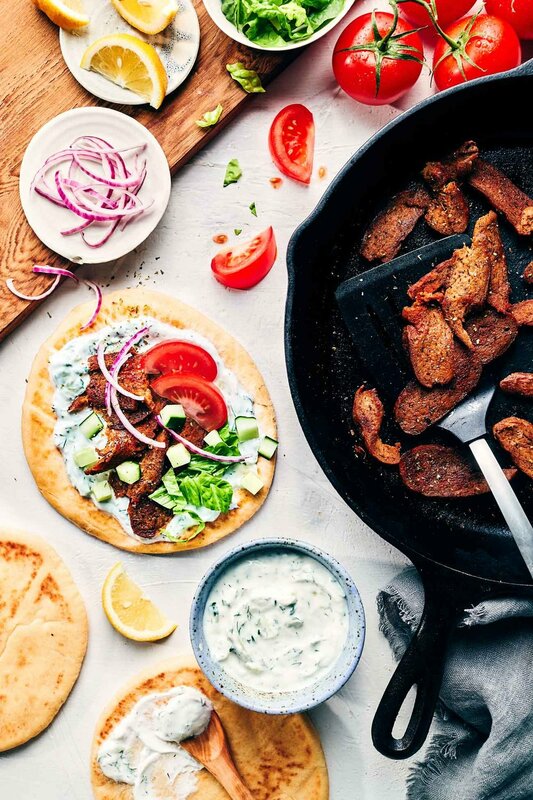 Making the vegan gyros meat isn’t difficult, we promise. All you need to do is chuck your ingredients in a food processor, blend until smooth, then shape the dough into a rectangular log and wrap it in tinfoil. That part should take you all of 5-6 minutes. Then, the gyros meat will bake in the oven to firm up slightly, before getting sliced into thin strips. Baking will take you an hour, but you won’t have to hang around the kitchen. The timing happens to be perfect for catching your favorite show (or two). Once the gyros "meat" is cooked, we like to go one extra step by sauteing the sliced “meat” in a skillet pan quickly before serving. It adds a slight golden brown crust to the sides and ensures your gyros are piping hot when they hit the table. 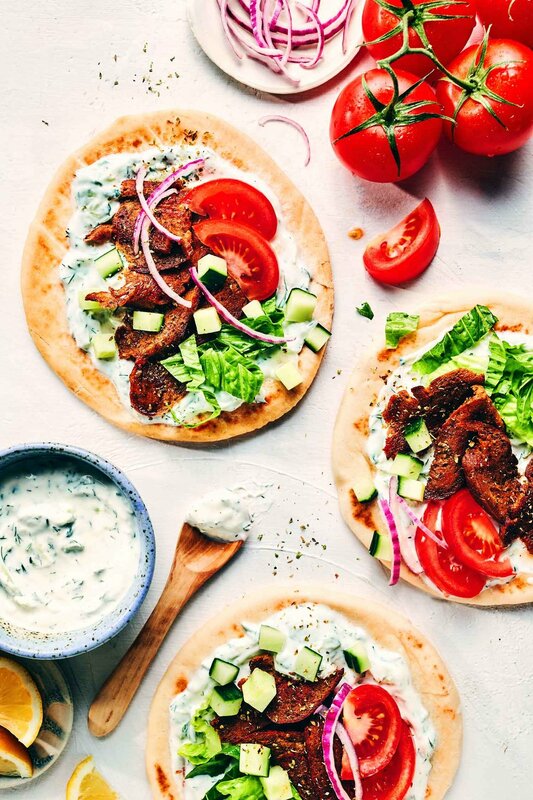 As with traditional gyros, you should definitely load up on plenty of tzatziki sauce and all the fresh toppings. The recipe below links to a yummy vegan tzatziki sauce from the blog, but if you’d prefer a dairy-based version you can use the one in this recipe instead. Leftover gyros meat can be stored tightly wrapped and unsliced. Then simply slice off the amount you need the next day and give it a quick saute before diving in. Preheat oven to 350°F. Set aside a baking tray and tinfoil. In a food processor, add cannellini beans, tamari, 2 tablespoons neutral oil, nutritional yeast and garlic cloves. Process until completely smooth. Add 2 teaspoons of dried oregano; and also add dried thyme, smoked paprika and black pepper. Pulse until evenly distributed. Add vital wheat gluten to the food processor. Process for 1 minute, or until the mixture comes together into a ball. Transfer dough onto a clean surface. 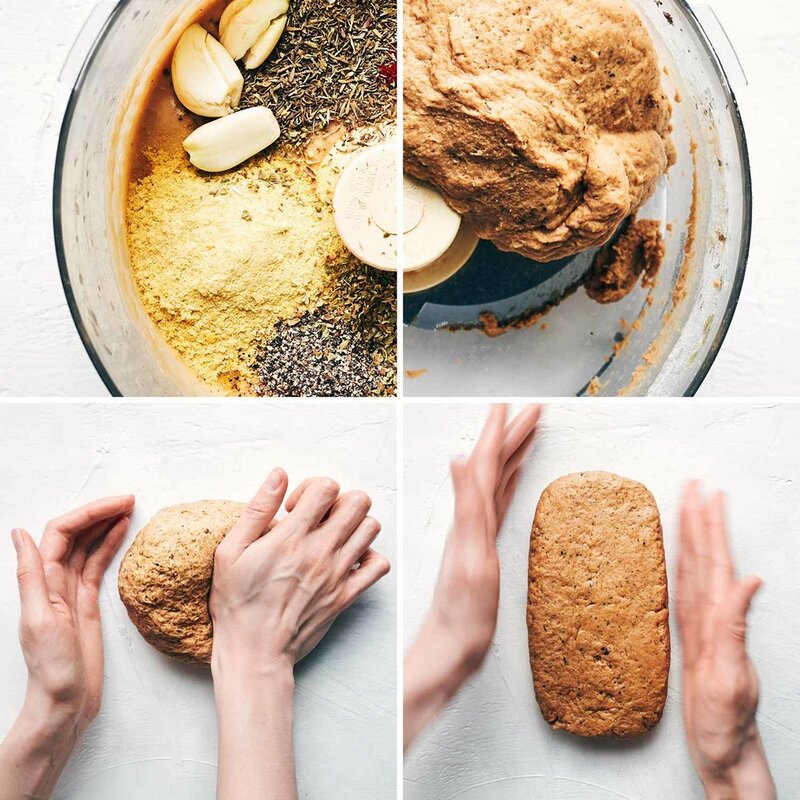 Knead dough (like you’d knead bread) for 2 minutes to ensure sufficient gluten development. Once the dough is firm and elastic, shape it into a rectangle that’s 7” long x 4” wide x 3/4” thick (18 cm x 10 cm x 2 cm). Use tinfoil to wrap the dough up like a present, ensuring all sides are covered. Put the wrapped dough on baking sheet, fold side down. Bake for 1 hour, flipping halfway. Once baked, remove from oven and set aside until cool enough to handle. Use a serrated knife to thinly slice the gyros “meat” into strips. Heat a seasoned cast iron skillet (or non-stick pan), over medium-high heat. Once hot, add remaining 1 tablespoon neutral oil and the sliced gyros “meat”. Depending on the size of your pan, you may wish to do this in batches. Sprinkle remaining 1 teaspoon of dried oregano over the meat. Cook for 2-3 minutes until a slight golden brown crust has developed, being careful not to burn. Serve on warm pita with lots of tzatziki. Top with sliced lettuce, tomatoes, cucumber and red onion. -*Smoked paprika is different than regular (sweet) paprika, and adds a mildly smoky flavor. This recipe calls for traditional smoked paprika, not the hot/spicy variety. You can read more about it here. -**Usually found in the baking aisle, near flours (as it is sometimes added to bread recipes). We use Bob's Red Mill Vital Wheat Gluten. -***Greek gyros are often served on fluffy pita bread. More often, it resembles the circular naan bread sold in North American grocery stores, rather than the thin pocket-type pitas. But feel free to pick the kind you like best. -Gyros “meat” keeps in the fridge. Slice and pan-fry only what you need immediately; keep remaining “meat” tightly wrapped in the fridge, slicing and heating as you need it.